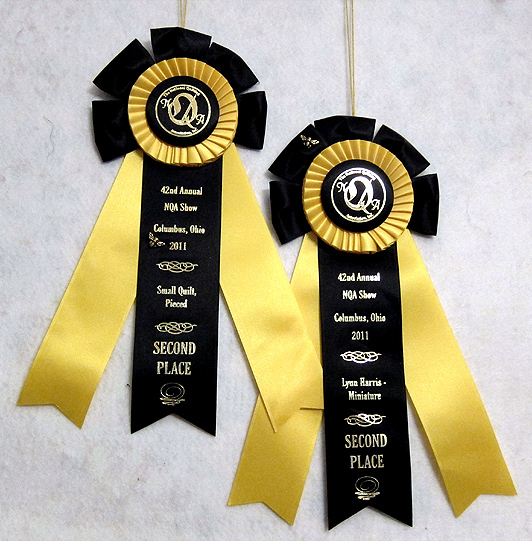 Returned from NQA: Two Quilts, Two Ribbons, Two Second Places!! Each of my quilts returned from the NQA Show in Columbus with its own ribbon! Square in Square I won second place in the Miniature category, and Five Bar Blues won second place in the “Small Quilt, Pieced” category. The judges comments on my quilts – which I am always very interested in – were very thoughtful and comprehensive, and they were even typed! I am especially pleased that my miniature was honored with an award in this show. It is the first award in a ‘Miniature’ category that Square in Square I has received. My quilts had barely returned home from Paducah before I packed them up again to send to the National Quilting Association (NQA) show which ran last week, from June 16 – June 18. Both Five Bar Blues (small pieced) and Square in Square I (miniature) were on display at the show last week in Columbus, Ohio. Did anyone see them on display at the NQA show? I wasn’t able to travel to see the show. I don’t think I am ever going to get used to shipping my quilts, but it was a little easier this time. Now I’m looking forward to their return home!